catch the copse where the cart collapsed? the tracks where the trains did not derail? the field where the sun was buried? something we are seen by–what? A poem of sorts. 9th for this April, 2015 National Poetry Month. Inspired by a Real Toads Prompt by Ella of Ella’s Edge, to write about the better depictor–as it were–visual art or language– The artist that came to mind for me is Anselm Kiefer, a great great (I think) German artist who makes extremely large paintings using a variety of materials including, and other than, paint. He was born in 1945. I wasn’t actually particularly thinking of the painting above in doing the poem, but this is one I’ve seen in person at an exhibition at Mass Moca (from which I’ve taken this image, without intending any copyright infringement.) 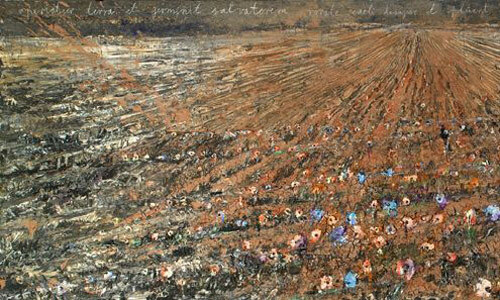 Images of Kiefer’s work can be found here. Quotes here. Note that when I first posted this, I did not put in a quote as asked by the prompt. (I forgot about it and only added this morning-Sorry, Ella!) Kiefer has many great quotes about art and history, and I only chose this because it gives a context to the work . This entry was posted on April 9, 2015 at 10:04 pm and is filed under poetry. You can subscribe via RSS 2.0 feed to this post's comments. Nice comparison, k. I believe that you can make your brushes tell what they feel without words. The elephants do, they have personality. I’m not good at it, but even at my stick man stage (still) I have learned how to draw in darker or lighter fill. It’s tax crunch time for me. Crunches do make it hard to read and comment. Writing a post is even more so. I like your comments, they are helpful. But it’s okay if you skip me for now. Loved the choice of artwork as well…! I think it’s a remarkable poem! This is so on point, Karin. How can artists portray the world we live in with any accuracy today, or at any time. The vast complexity of human interaction, trial and conflict defies paint or words. Hi Kerry–thanks. Kiefer first painted about Germany and WWII, of course–I added a quote now making that clear, but those paintings work for now too. k.
You and I share the same appreciation for his art ~ Chicago in the late 80’s I believe my first in person glimpse. I fell head over heels .. his work is grand, intriguing, huge! Bravo! You embraced this challenge, so well~ The lines you shared of the paint not being the same, the world with its gaping broken heart~ Your images haunt, as they should-you gave us the heart of the artist, his hands painting his world! when meaning’s gone……….. so true. You’ve said it well. “…how does line define/ meaning’s capsize? ” great scissors of a line that cuts the shapes out created by both word and paint–also the deluge at the end fits the subject and avalanches on down with the things that are really, beyond our grasp because our minds are not big enough, which is probably in this case, just as well–yet even not grasping, they can still be smashed by thatTitan’s rain. Not familiar with this artist’s work, but you have made what you used familiar and real. LOVE! containers of the broken are impossible …but this poem does that impossible very well. This really is quite extraordinary. Your build your poem, like filling a car or cart, with words, with meaning. And so artfully done. This really should be read aloud to be appreciated fully. Thank you so much, Mary. I don’t think the title quite works to give a sense of Kiefer’s work or what I was getting out, but it is hard this month to quite get things right. I very much appreciate your kind comment. k.